POSSIBLE THRONE OF GLASS SPOILERS! I'm going to keep this review as general as possible, for fear of spoiling anything. But, just to be safe, you should probably read Throne of Glass. Or read this review at your own risk. Though it will be general! This book picks up about where the first one leaves off. Celaena is know the King's champion, and she is sent to kill the king's enemies. Except, she doesn't want to kill anyone. So she finds ways to get around doing the king's bidding without raising his suspicion. But then the King order her to kill a man she knew in her past named Archer. While she is on the quest to find a way around killing Archer, she discovers new and terrifying things. The King is not the only person she should fear. There is something - or things - that he has, that he possesses, that endangers the lives of everyone. Basically, the first book was centered around the competition. This book is centered around Archer's demise. Celaena discovers more in the king's palace, as she goes exploring even more, past the ancient king's tomb. Secrets are made known. Promises are made. Lives are cost. The plot of this book is phenomenal. Ms. Maas doesn't just have this book centered around Archer's impending doom. There is also Celaena's exploration of the palace, her discovery of new things about the Fae and evil forces, and her romantic life. Ah, the romance. I was team Dorian in the first book. Now, I sort of hate Dorian, and totally am team Chaol. Go Chaol! Love you too! Things happen between Chaol and Celaena that pushes them together. But then, things happen that push them apart. I have no idea where the romance is going, but I genuinely like how Ms. Maas is treating the romance between her characters as if it weer a real romance. She jerks them around, but she makes the characters FEEL everything. However, the romance was the thing that I really hated in this book as well. See below. Overall, this book was great! There are SIX books in this series. Book one - the competition. Book Two - Archer's doom. Book Three - the Fae (not telling anymore than that!). The romance. I. HATED. IT. Of course, above, I said I loved the romance, and how Ms. Maas made everything real, but I hate what she did with the romance in this book. In this book, Dorian makes a choice to try and forget Celaena. Also, Celaena makes a choice with Chaol. HOWEVER, something happens that causes Celaena to basically go insane and try to kill Chaol, and run straight to Dorian. NOT romantically, but it totally could have gone the romantic way with Dorian and Celaena. Here's the thing. I WAS team Dorian in book one. I'm team Chaol in this book, and probably the rest of the series. I liked what Ms. Maas did in the first half of the book with the romance. But what she did in the second half? Bulls***. I hate Celaena. I loathe her, even. She abandons Chaol, and runs straight to Dorian, under the pretense of needing a friend. BULLS***. Celaena is so ridiculous and I absolutely hate her. She's redeemed a tiny bit in my eyes because of the end, and what she says (even though the end is not all a resolution between Chaol and Celaena). Celaena kept her duty from Chaol; why is it any different if he keeps his duty from her? And then she goes insane when The Big Thing happens. I really don't believe her reaction AT ALL. Again. BULL. S***. Here's another thing: she's so "bada**", but she kills NO ONE, and she whines and moans A LOT. I'm not seeing what's so "bada**" about an "assassin" that doesn't assassinate anyone! I sort of understand the moral question, but how can she have any morals whatsoever, when she's proudly named Ardalan's Assassin (or whatever)? Doesn't make sense to me. Actually, that makes me really angry. You can't have it both ways, Celaena. I hate her. A lot. Sort of. I know I just went on a bit of a rant with the last section, but there's no need to stop reading this series! At least, that's what I'm telling myself. I hated the romance, and I hated Celaena. BUT. The plot, the story of this book? Awesome. I loved Throne of Glass way more, but I think most people will enjoy this sequel. I'll probably read the rest of this series (there are SIX books! ), but we'll see. 3 stars. Not perfect, and no where near the quality of Throne of Glass (in my opinion! ), but a pretty great sequel nonetheless! I liked the romance in the first book (sort of), because it didn't feel dominate. The competition came first. In this book, the romance is basically EVERYTHING. And LOL! I guess we don't share that neural pathway ;) Yeah I really dislike Celaena. But, I'll probably continue with the series. Aww, you're so nice, Carina. I'm sorry to hear that you didn't like the first book enough to finish it. 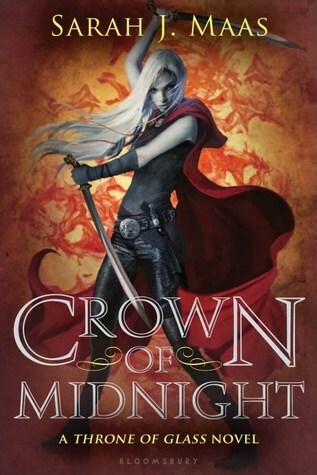 I really liked Throne of Glass, but clearly, Crown of Midnight was filled with issues, for me. I liked it enough to give it three stars though. The heroine was a BIG problem though. The ending had a bit of redemption... I guess I'll see as the series goes on! One thing is for sure - I am NOT buying any of the books. I'll request them or borrow them, but until the series ends, I'm not buying anymore. Oh wow you really do hate Celaena! I do kind of think that when a character evokes such deep emotion from readers it attests to the author's strong writing... but I do get where you're coming from. I really hate it when a girl runs to a guy in the pretense of friendship (it works both ways). So annoying! Unforunately, my feelings about our protagonist here did a 180, from Book One to Book Two. Maas did an excellent job of making me hate Celaena, I'll agree with that :D Hopefully, the future books are better, at least for me. I haven't started this series yet, but I've only read a couple of books that have made me do a 180 like that between characters. I can't wait to start on this and see how I feel! Great review! Hmm, if you start this series, I hope you enjoy it! I guess the author did a fine job of making me crazy! Thank you! Is it sad that I want to read this series more now simply because there is a character named Dorian? I haven't read the first one but I've heard about Celaena's tendency to not kill anyone, which I admit is really weird. Especially since the cover is freaking BA. I really hope the series gets better for you! Great review! Wow you are the first I see who did not totally love the book. Glad you gave an honest, great review. Sorry to hear that you hated the main character too lol. I still want to read it and see what all the hype is about. Right?! That's how I feel sometimes! I'm so weird. It's hard to completely LOVE a book when you hate the protagonist, right?! I'm glad you'll still read this one. Thank you, Stacie!